Jess Bein The Hero is among the 34 hopefuls entered in Friday’s 400-yard West Texas Maturity (G3) trials at Sunland Park. SUNLAND PARK, NM—FEBRUARY 11, 2019—Jess Bein The Hero and SF Hot Pass are among the 34 sprinters entered in Friday’s 400-yard West Texas Maturity (G3) trials at Sunland Park. A black son of Valiant Hero trained by Josue Ponce for owner Juan F. Martinez-Labastida, Jess Bein The Hero will be making his 6-year-old season debut off of a second-place finish, one length behind winner Jessies First Down, in the 440-yard, $350,000 Championship at Sunland Park (G1) on December 30. 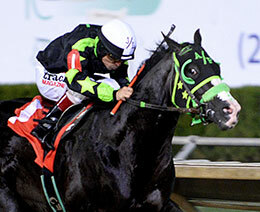 The stallion won two stakes and earned $156,317 from five outs last season. Jess Bein The Hero drew post 2 and will be ridden by Manuel Gutierrez in the second of four trials. SF Hot Pass won all three of his starts during the Lone Star Park fall meet, including the 440-yard, $75,000 Refrigerator Stakes (G1) on October 13. A 6-year-old Ivory James gelding, SF Hot Pass is trained by Jackie Riddle for owner Shannon “Stormy” Fisher. SF Hot Pass drew post 7 and will be ridden by Francisco Calderon in the second heat. The 10 fastest qualifiers will meet in the March 9, $100,000-est. West Texas Maturity final. All Sunland Park races can be seen at Q-RacingVideo.com.